Ok so this is my first kite revenue so be gentle. I'll start with a bit about me and what I look for in a quiver of kites. I have been kitesurfing now for almost 18 years and my style has not really changed much over that time, its a mixture of wakesyle, freestyle and the odd bit of old school dangle. I've also used C kites for most of that time. Being the wrong side of 50 now I need a kite that pops well and slacks easily, otherwise my old arms just can't pass the bar. I'm not as flexible and fast as I used to be, so I can really feel a bad kite, or one that doesn't suit me straight away. After the success of the RPM with Youri Zoon most kite manufacturers now makes a 3 strut kite that they claim can do just about everything from wave riding to unhooked freestyle and everything in between. I've tried these in the past but have always been a little disappointed. Airush advertise the 2018 union as being redesigned for unhooked riding so I was keen to see if this is really the case and what it was like for freestyle . The kites were borrowed from airborne and this week we got the first few days of sea breeze in Perth, so loaded up with a new set of kites I headed for my local spot. It's not the best spot for freestyle as it's fairly choppy, but it often gets slightly more wind in perth. The wind was only about 15 to 17 kts so definitely at the bottom end of the kites wind range. The sizes didn't quite line up so I borrowed a 12m union and a 13m and 11m Razor to compare. With 4 hours on the water and 15 to 17 kts I had all three kites rigged up on the beach so it could switch between them. First up I love the new airush colours and they look awesome. They are made of D2 Technoforce (not a 90s house band, but a kite material). Their brochure goes to great length to explain that they also have strands of dyneema sown across the canopy, in a sort of spiders web type pattern to stop stretching. 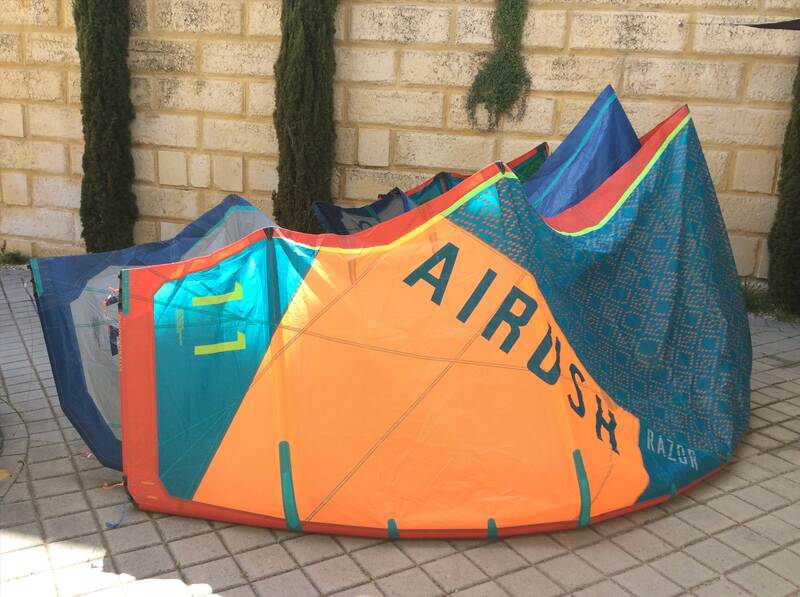 Airush claim that this will double the effective life of the kite. They even supply a small sample attached to the bag so you can try and stretch it yourself to see if they are right LOL . I'm not sure this is totally a new idea as I remember some windsurfer sails started doing this in the 90's. Anyway it looks strong and the idea sounds good to me. Big green thumbs up from me for also using recycled plastic bags to make the kite bag. Plastics getting into the ocean is a real problem and if every company does just a small bit it will make a difference. The bar ticks all the rite boxes for me, a below the bar swivel, plastic coated depower lines and chunky floats .The thin bar feels great and the grip is awesome. I also noticed the 5 line bar comes with a oversized chicken loop that can be fitted for unhooking, and the leash attaches with a larks head rather than the usual oversized metal clip that always gets in the way. The union has a wider chord in the centre but tappers more at the tips with a swept leading edge.The power of both kites is exactly as I'd expect from their size but as a comparison I'd say the Union developed slightly more power. Comparing the 12 Union to the 11 and 13 razor I recon it was about 3/4 of the way between the two. Not a whole kite size bigger but a bit. To go upwind In the lighter conditions, the razor needed more effort, more careful edging and working the kite more. Compared to the union, which was just easier, just sheet in and let it pull. Looping both kites is easy however the razor definitely develops much more pull. The steering on the razor is very sharp and precise even for a C kite, and it gives a lot of feedback. The union being a bridled kite has a fraction of a second delay between the input and the kite reacting. I would imagine this would be a lot less on the smaller sizes and it would probably not be noticeable if I wasn't flying it back to back with the razor. The pop and slack on the razor is as good as I've used and it feels nice and predictable. The pop is explosive and then is slacks perfectly. On the union it pops more progressively and about 90% of the razor, and then it slacks in a more gentle taper off, rather than the explosive pull and then sudden slack of the razor. What I also found is that in the lighter winds I could twitch the kite (yeah I know it's bad form) to get a bit more pop on the razor and there was still enough slack to made an air pass, but I couldn't get a cheating twitch to work properly on the union quite so well. When landing towards the kites unhooked both kites held up well in the lighter winds, the union only showing a slight tendency to luff when I was too slow to hook back in once, but it only dropped back about a meter and was easily flying again. So my thoughts on the new union. Well for someone getting into freestyle and wanting a kite to also cruise around and do some wave riding and dangling it's perfect. For learning to land wrapped and blind it is probably the easier of the two, and even for blind judges with an air pass it's really good. I sometimes struggle with turning a blind judge into a back313 and unlike the razor I couldn't get close with the union, so for much more than a blind judge I'd say the razor is king. Thankyou for your review,I always value your opinions. And I agree, the colours do look sic! Couldn't agree more, both are great kites but I'm all about the simplicity performance these days having ridden the razor for 3-4 seasons, so a huge plus one for the union (don't unhook much these days though), anyone contemplating a new kite defiantly get into Airborne in ozzy park and give one a shot i was hooked upon first go! plus windrange is awesome!